As more warnings go out to coastal communities about rising sea levels, local planners are starting to sharpen their pencils. Hence the Ocean Beach Master Plan. The San Francisco Planning + Urban Research Association (SPUR) is facilitating a coordinated effort among multiple agencies to create a “sustainable long-range plan” for San Francisco’s shoreline. Why do we need a plan? Because erosion of the beach and anticipated rising sea levels may necessitate major changes in the infrastructure that serves the area. In September, economist Philip King of San Francisco State University unveiled a study aimed at putting estimated price tags on potential economic losses from sea level rise, a study in which San Francisco’s Ocean Beach emerged as a major potential loser. What led up to this plan? In large part this is a project that goes back many years through multiple permutations of task forces and projects under several different mayors. 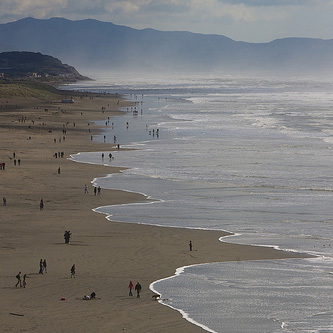 There have been people who are concerned that no single agency is responsible for Ocean Beach. The belief is that too many agencies are responsible for too many things and they don’t always talk to each other or pull in the same direction. So a lot of people who care about Ocean Beach have been trying to get everyone on the same page and create a way forward, something everyone can live with even if they don’t get everything they want. Explain what agencies are involved with Ocean Beach. The beach itself is part of Golden Gate National Recreation Area (GGNRA), from the O’Shaughnessy Seawall in the north, opposite the beach chalet that you walk up to to get to the Cliff House. Everything to the west, the sand side, is GGNRA, down to the wet sand of the beach. On the other side of that seawall is the parking, which is city property. So the city manages and is responsible for the parking lot, but if you go down those steps, you’re on federal property. Those are the two main agencies. The CPUC has a great deal of infrastructure that is at or near the beach. There’s a major sewage transport tunnel that lies under the Great Highway, which feeds the oceanside water pollution control plant at the south end of Ocean Beach. That’s city property that is operated by the SF Public Utilities Commission, but the responsibility for maintaining infrastructure like the road and the oceanside water pollution control plant is all done by the SF Dept of Public Works. In addition there are responsibilities that overlap. The state Dept of Fish and Game, for instance, enforces fishing regulations. What are some concerns being addressed in the Master Plan? One of the big challenges Ocean Beach is facing is what will happen if sea levels rise, as it appears they’re going to do. We’re seeing some erosion, especially on the south end of Ocean Beach, that could be attributable simply to singular storms. Those have caused some major problems, including the closure for several months of the southern extension of the Great Highway. But in addition to those singular events, there is the likelihood that the sea level is going to rise, and when we get large storm surges, they’re going to have a greater impact than they have now. So the question is what is the impact going to be on the beach. Are we going to have a nice sandy beach, or in order to protect some of these things like the Great Highway and the sewer transport tunnel and the water pollution control plant, are we going to have to install large seawalls or something like that? Does the plan put forward some suggestions on this? These are big infrastructure suggestions. How do people feel in the neighborhoods around there feel about them? That’s a really good question. I think in spite of the fact that potentially there will be some major changes, a lot of people aren’t paying a lot of attention to the plan, or if they are it’s not coming through in terms of the voicing of opinions. That in part is due to the scope and scale of the Ocean Beach Master Plan. It’s so large, it encompasses the beach from north to south and plans for several decades, and it’s hard for people to get their minds around . But I have heard from some readers who are concerned about the Great Highway in particular. I got email from a reader who wondered that if there’s ever a need for emergency transportation out of SF, where are the residents of Richmond and Sunset going to go? How do they get out of the city if they’re not going north over the Golden Gate bridge or east across the city. If they need to go south, how do they get there? The surface roads we have there are not designed to handle a great pulse of traffic like that. the Great Highway is in this reader’s opinion a necessary artery out of the city for those residents. But one of the questions is: can we maintain the Great Highway there no matter what we do? Is the ocean going to make a decision for us if we don’t make one through the master plan now? SPUR’s plan kind of acknowledges that and moves the traffic from the Great Highway southbound lanes and puts two lanes, bidirectional traffic, on the east side of those, where we have northbound lanes now. it acknowledges we have a lot of blowing sand, and that we need to blunt the impact of major storm events. So, what is SPUR’s function? SPUR is in the process of gathering public input on their draft proposals. They are going to take that public input into account to see if they are on the right track. They will come back with a revision later on with the goal of having a completed plan in Feb, 2012. This post originally appeared on KQED’s NewsFix blog. It’s the right thing to be doing. I admit that I don’t know the scope of sea level rise that they are planning for. However, if they are using the IPPC’s 4th Assessment Report, they are outdated. New information shows that warming is happening much more quickly than anticipated and confirm that some areas will see a greater rise in sea level than others. This is the most laughable fantasy story-since the last one posted on this site. According to NCDC, the national climate data center, the temperature in all 50 states has actually cooled, not warmed, over the last decade. It really is time to turn off the propaganda. To make matters worse, the State of California is considering mining (selling) a large quantity of sand located in San Francisco Bay just inside of the Golden Gate Bridge. This sand would have moved onto the San Francisco Bar shoal and would nourish the southern portion of the San Francisco coast, and probably also the northern beaches of the City of Pacifica. So the proposed sand mining will simply make matters worse. However, we need sand and gravel to produce the public works in San Francisco. One response to this problem would be to charge fee on each cubic yard of sand removed so that sand could be imported from an area in the large sand dunes in Canada which are not part of the littoral system. http://vimeo.com/24850686 . The part of the video showing where sand from the littoral cell goes starts at about 0:25. Leave it to San Francisco to spend millions of dollars on one of the biggest scams ever to be promoted. Maybe they didn’t hear about the scientific data; some relating to forecasted sea level rise, that was “doctored” by two well-known scientists studying “climate change.” They later admitted that the actual ocean temperatures would not be 3 degrees warmer, but more like 1 degree or even less. They stated that they did it because they didn’t want the public to become “complacent” about global warming. It was actually in the print media. It ran for one day and was buried on the 4th page. Wake up people. Have you checked out the Sierra Nevada? We’re going to be skiing by Thanksgiving for the first time in over a decade. Gosh, do you think just maybe we might be in a “cooling” cycle….again? ?